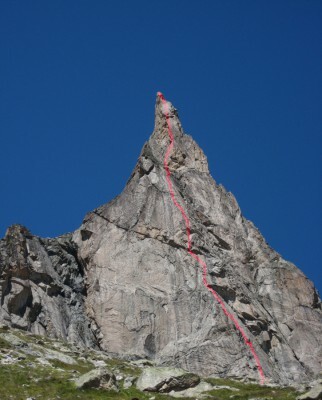 A photo in the book “Parois de Légende” by Arnod Petit draws our attention to this unique peak. The book lists the 100 most beautiful climbing routes in Europe, and in it Aiguille Dibona is described as the “arrow of uncertain equilibriums”. 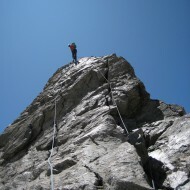 The photo shows a pyramid twisting towards the sky in an abnormal, impressive way. Seeing it from the south side you cannot imagine why it is still standing there. 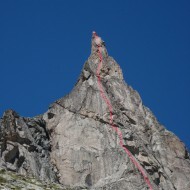 The most direct line up the steep south face is a route called Visite Obligatoire, 400m, 6a+. 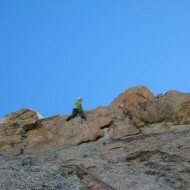 A sustained and solid route on slabs to vertical walls with characteristic water runnels. 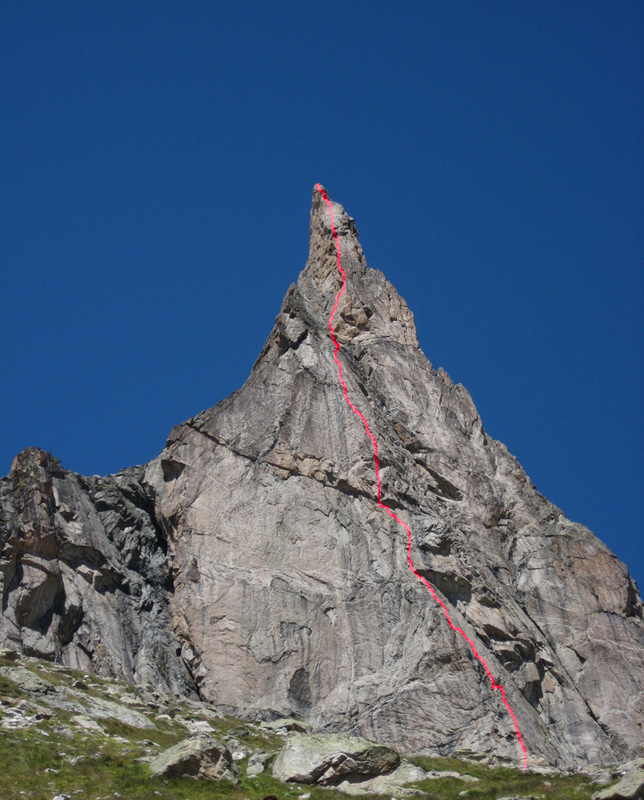 This route becomes the objective of our 2-day trip down to Massif des Ecrins in the southern French Alps this week. 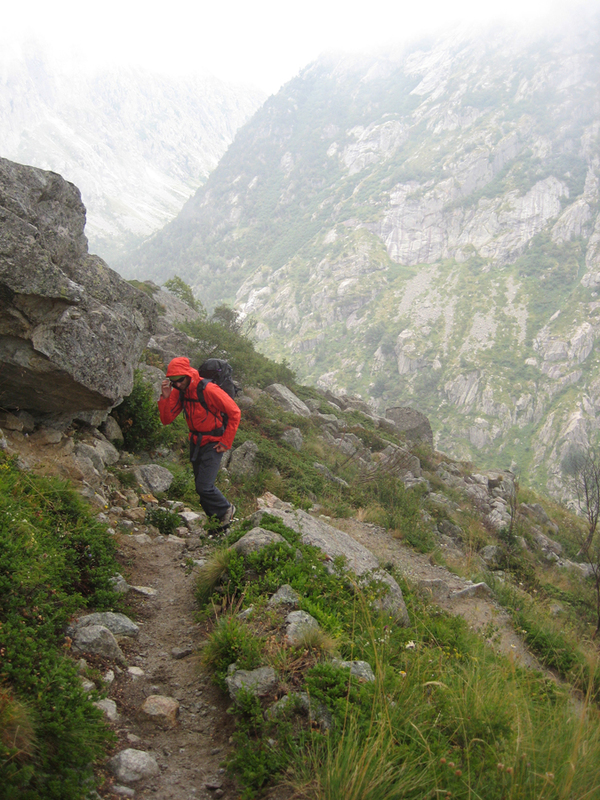 Being very excited to see the legendary arrow of rock, we are quite disappointed walking up to the hut in a complete white-out, seeing nothing but our own shoes on the trail for 2 hours. When driving away from Chamonix and the hyped Mt Blanc area towards the less aggressive mountains in the southeast Alps the nature changes and it becomes somehow more quite. In the area between Gap and Briancon, in le Massif des Ecrins, people are openly friendly and helpful in general. 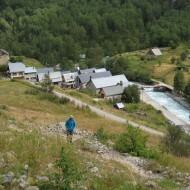 It is a relaxed place, genuinely French, and there is plenty of space for climbers and hikers. 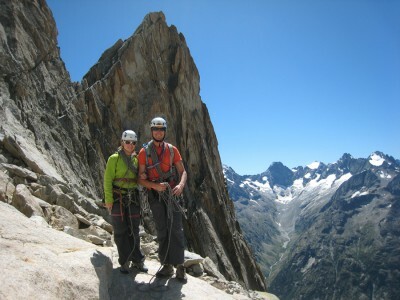 Many prefer the mountain idyll here to the more crowded, world famous climbing resorts like Chamonix and Zermatt. 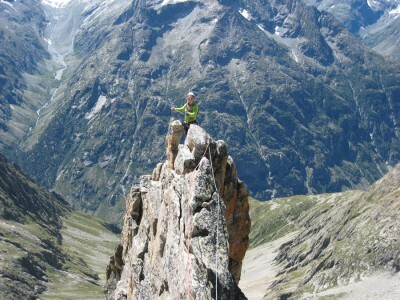 Here Aiguille Dibona instead of the Matterhorn completes the post card scenery. We are charmed from the start. 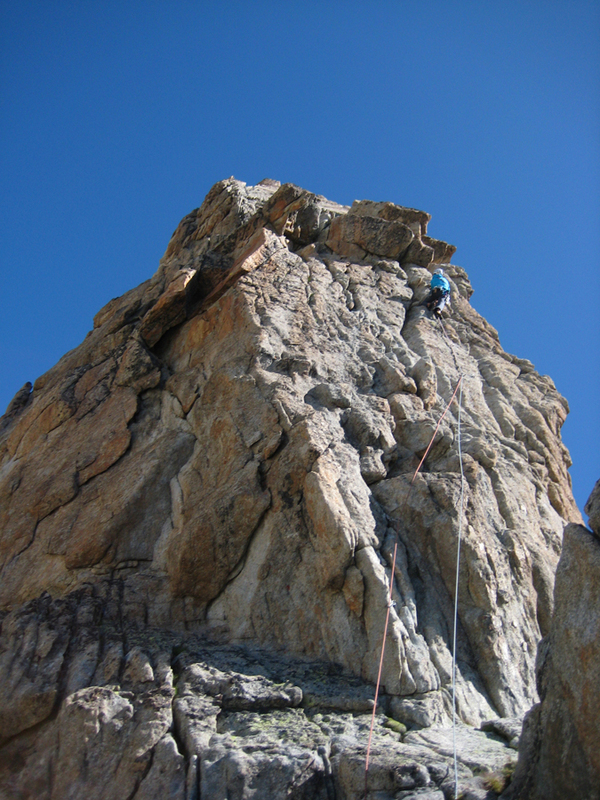 Cruising around the mountain lakes, checking out some sport climbing close to Gap, then heading back up to Vallee d’Oisans. On winding roads we get to the village Les Etages from where we walk the 1100 height meters up to the Soreiller hut, located at the very base of our climb. Being fairly cold from walking in the rain we were happy about all the fellow climbers in the hut, warming up the main room slightly. The dinner was not impressive, appropriate only for a mountain hut, but otherwise the hut is well equipped and the guardian is nice. Our plan is to have 5am breakfast and be the first ones on the face the next morning, and so we do. Seeing the spectacular mountain for the first time in the pre-dawn light is intimidating. Astonishing beauty behind a cold wall of moist, the rock is striped black by the rain. We go back to sleep for another our. 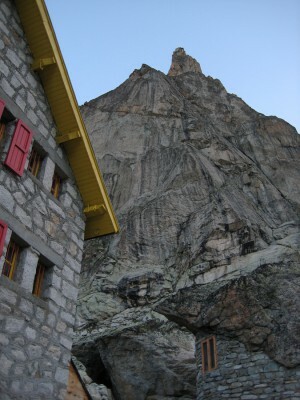 At 7am Aiguille Dibona is in a different light and has dried a little more. Now it is irradiating a desire to be climbed and we are the first ones attacking Visite Obligatoire. 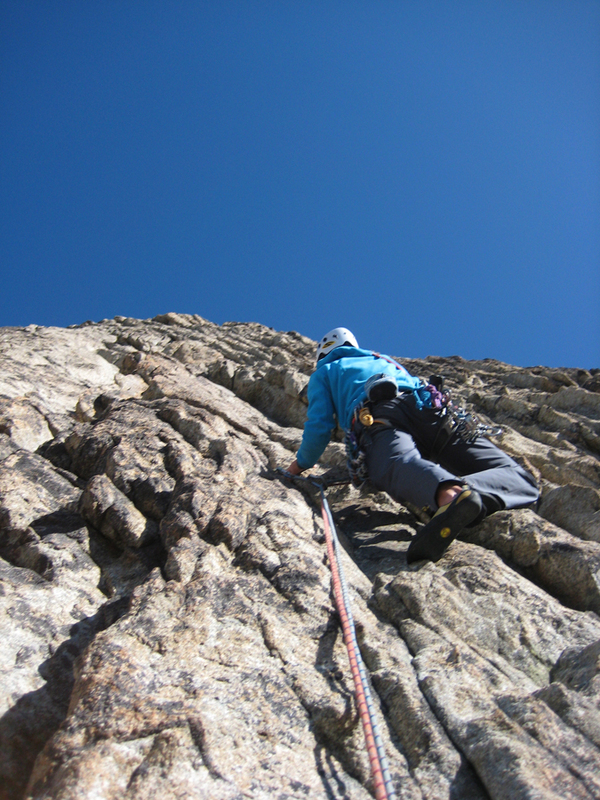 Knowing the route is technical and bolted in mountain route style, which means you have to climb several meters between each protection, we consider the climb a proper challenge. The first pitch is a vertical wall followed by a slab that is as poor on holds as on bolts, a quite brutal warm up for our cold fingers. 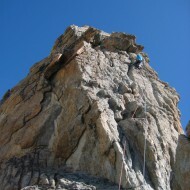 Continuously the technical and sustained 6a-climbing is interesting, and luckily well within our limit. 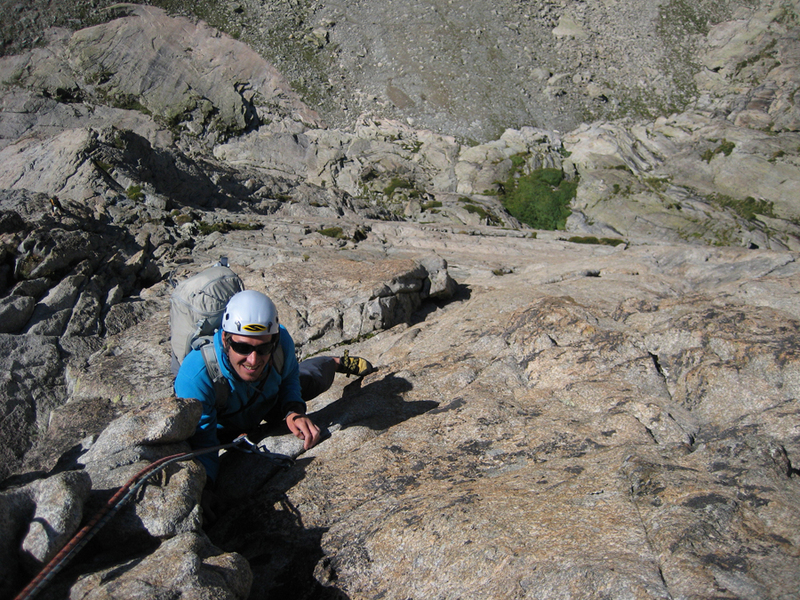 Gradually it gets steeper and we are introduced to the challenging “cannelures”, water runnels that provide rounded, vertical holds for both hands and feet. 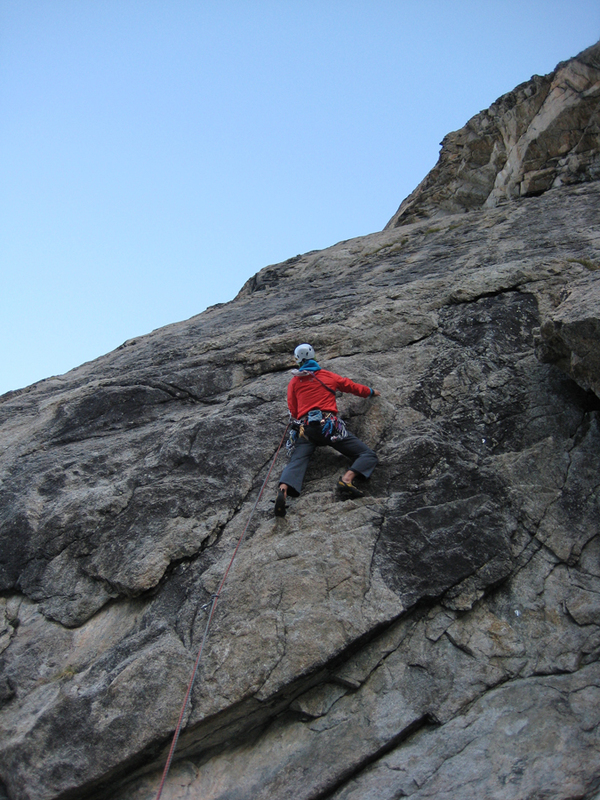 After a while we get used to the peculiar style of climbing on the steep water runnels that requires using oppositions and simply trusting the friction under our feet. 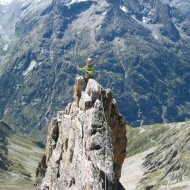 Keeping calm and always searching for the best itinerary the balancing dance upwards becomes a pure pleasure. 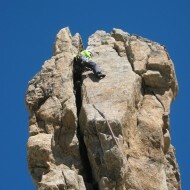 The rock is solid and the exceptional friction inspires confidence. Half way up we reach easier ground. 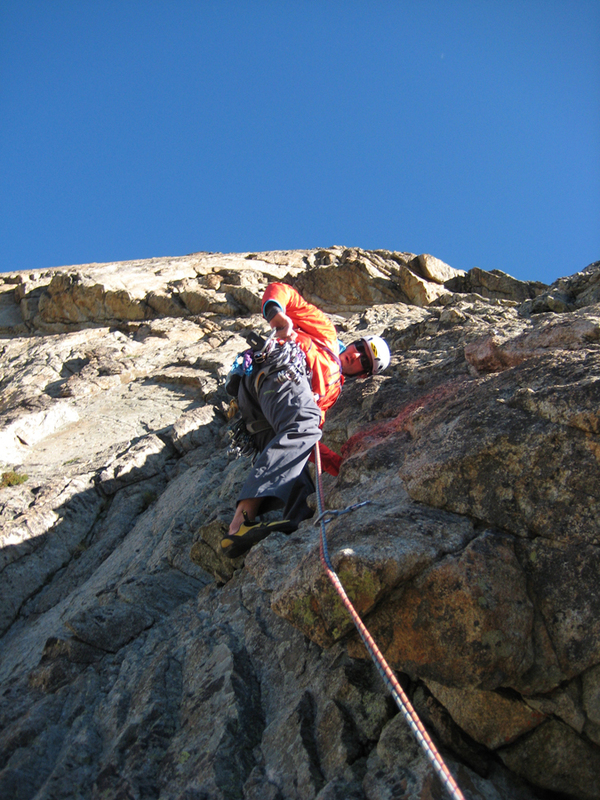 Some ledges interrupt the enjoyable vertical pitches and lead us to the partly overhanging upper pyramid. 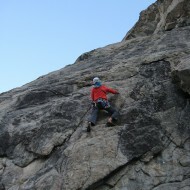 Here handholds are bigger and the exposure is growing from airy to extremely airy. Just below the last 4 pitches, we pass a perfect little pick-nick terrace with views of the hut that is now the size of a piece of Lego. No rest just yet. We are too excited to reach the summit. Access: Driving from Grenoble you take the direction Briancon, pass Bourg d’Oisans and 5km later take right towards St-Cristophe-en-Oisans. 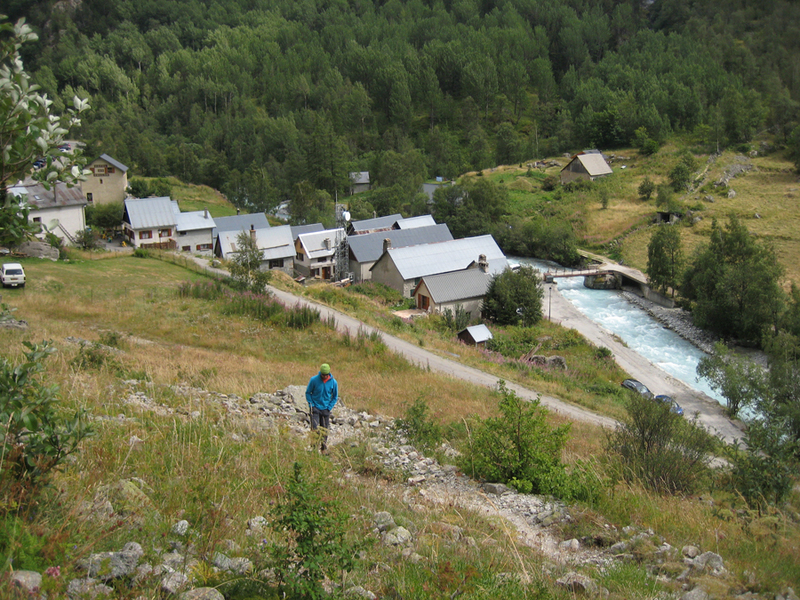 Continue this small road towards Berarde, stop at the village les Etages (8km after passing St-Cristophe). 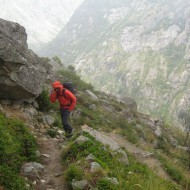 Park at the village entrance and you will find the trail to the Soreiller hut in your left. From les Etages the trail ascends regularly for 1125 height meters and you reach the hut after about 2 hours walk. 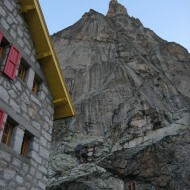 The hut is situated at the foot of Aiguille Dibona at 2700m. 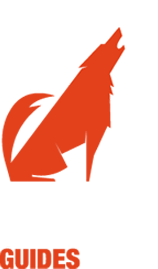 Reservation in the hut is obligatory, call +334 76 79 08 32. Best time: In summer. 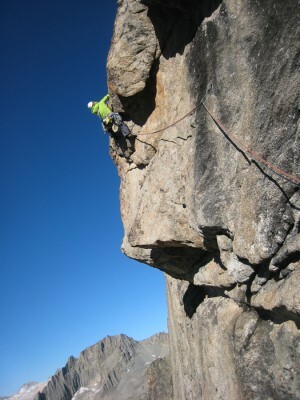 The south face dries quickly after bad weather. Guidebooks: All routes are marked in a folder in the Soreiller hut, but these topo-drawings are not always very descriptive. 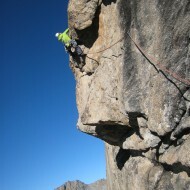 Better is to research some routes in Oisans moderne or Oisans Sauvage by Jean-Michel. 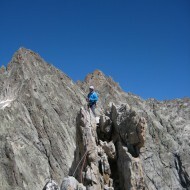 The older, historical routes can be found in Le Massif des Ecrins by Gaston Rebuffat. A few classics (including Visite Obligatoire and Voie Madier) are described in Parois de Legende by Stephanie Bodet and Arnod Petit. 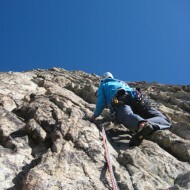 Tips: There are many nice routes around the Soreiiler hut and it is recommend staying for a few days up there. 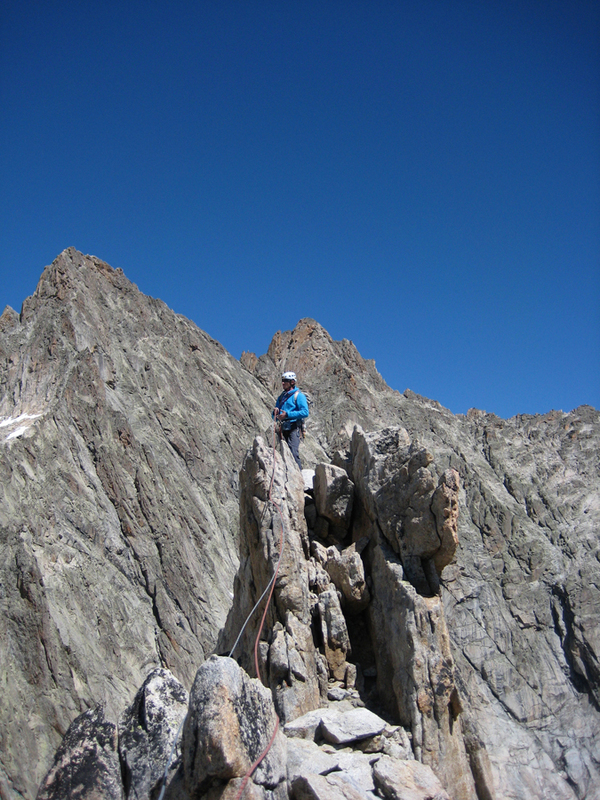 Approaches are relatively easy and there is no need for early alpine starts. 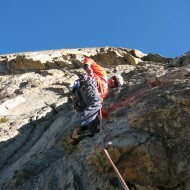 A pleasant way to practice alpine climbing. 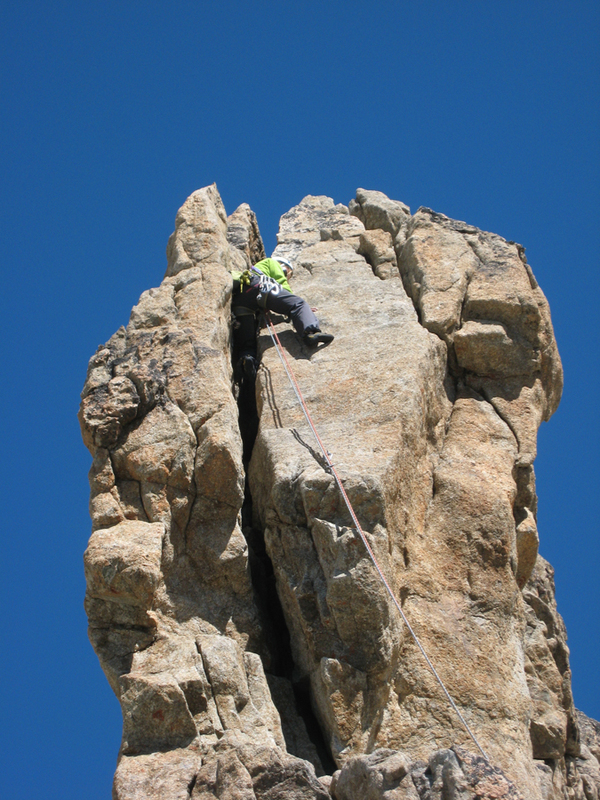 – Back in Chamonix we climbed a second classic rock needle – Aiguille de Peigne. 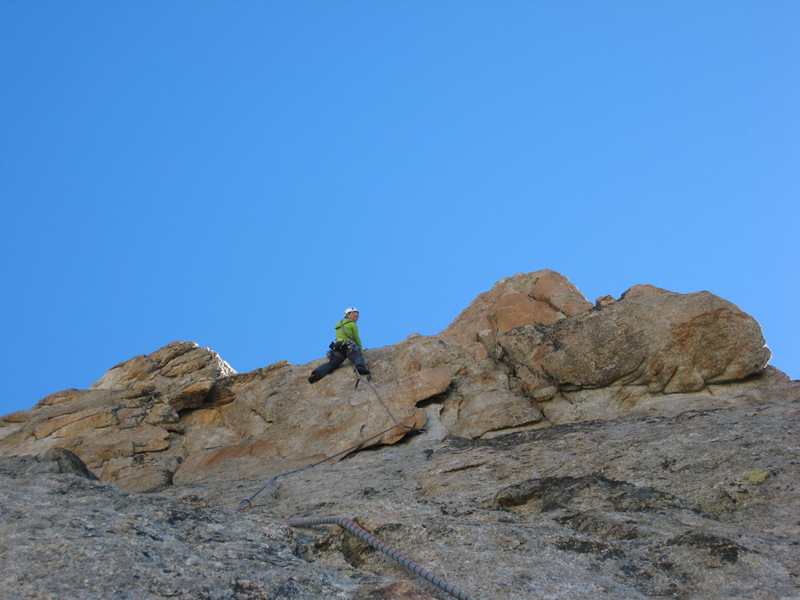 The photo gallery: Climbing Normal Route on Aig. de Peigne makes a good route description. 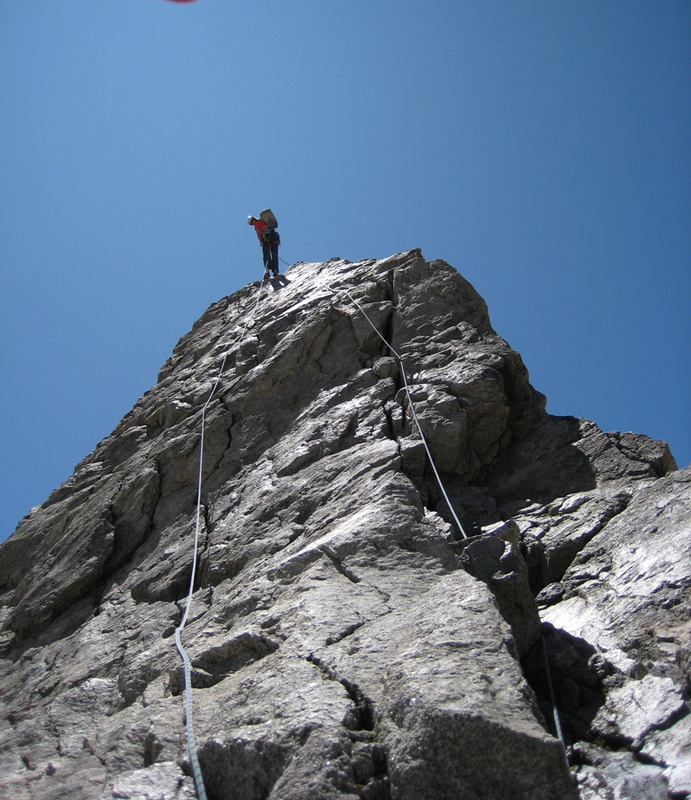 – Are you up for climbing a few rock needles in the Alps? 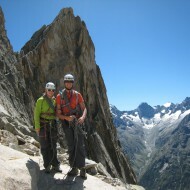 Guided alpine rock climbing by Mountain Spirit Guides in Chamonix and elsewhere. Photo Gallery: Images from most of the pitches of Visite Obligatoire. 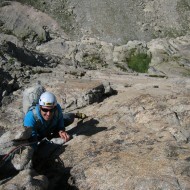 Tags: Aiguille Dibona, Les Ecrins and Visite Oligatoire.